From a bird’s-eye view, or respectively on the map, Guadeloupe looks like a butterfly. Basse Terre is the name of the western mountainous wing with the steep coast that is of volcanic origin. Grande Terre is flat with a coral-chalky soil; beautiful coasts fringed with palm trees and sugar cane plantations. The Rivière Salée is the natural divide between these two halves and can be sailed very cautiously by yacht. Before being baptised by Columbus with its present name, the island was named Karukera, island of beautiful waters – and the French overseas department still boasts plenty of it: coasts with colours ranging from indigo blue to turquoise green and many rivers, ponds and waterfalls in the interior of the island. 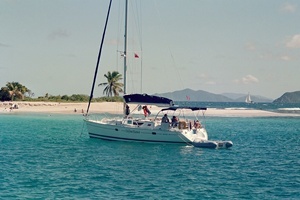 Charter sailors often arrive from the North from Antigua; from the South from Martinique or they charter directly in Guadeloupe, usually in the relatively new and well equipped Marina du Bas-du-Fort in Point-à-Pitre. Right beside the harbour, the Blue Lagoon or Lagon Bleu, is very safe for anchoring. A few nautical miles southeast, the bay of Le Goisier abaft the same-named island, is an area that was dubbed the Riviera of the French Antilles by the French owing to its beautiful beaches. And it is very suited as a day anchorage thanks to the protection offered by the offshore reef. Further east the visit of the Marina du St. François is worthwhile – surrounding the marina are boutiques, restaurants and all amenities. Off the south coast of the island, directly south of the Yacht Charter bases in Point-à-Pitre, are coral reefs, secure anchorages aren’t available – it is advisable to make the quick side-trip to the Iles de Saintes. The west coast essentially offers two beautiful and safe bays: the island of Anse Deshaies boasts pure unadulterated French Caribbean charm– the ones arriving from Antigua, will usually stop here first. Palm trees, a pretty village with a church, small shops offering fresh baguette and freshly caught fish, good restaurants and a dinghy dock. From here a stroll leads along the little creek through the tropical rainforest with waterfalls that gather in the basin and form a freshwater pool. Further south is the Anse à la Barque, where you’ll occasionally encounter someone at anchor. Basseterre, the main town of Guadeloupe, admittedly has a harbour for ferries and cargo vessels but doesn’t offer much allurement for „yachters“. There is a marina two miles further southeast: Port de Rivière Sens with some good restaurants. A true bijou of the Caribbean is the little archipelago of the Iles De Saintes, consisting of five little islands. Notably Terre d’en Haut, one of the two main islands, lures with charming bays and anchorages. Especially scenic: the village Bourg des Saintes in the Anse du Bourg, favoured stomping ground of “yachters” from around the world and weekend destination for sailors from Guadeloupe. The inhabitants are descendants of French Normans, thus the culinary specialties are great. The stroll to the old Fort Napoléon is worthwhile. Further southeast the Anse à Cointe lies picturesquely in a Palm grove. The area near the offshore island of Ilet de Carbrix makes for good anchoring. Windmills and sugar cane fields predominate the flat island of Marie Galante, anchoring is possible off Saint Louis and Grand Bourg. You’ll get provisioning in many little shops in Saint Louis. Sulphur springs, waterfalls, brooks and rivers, high mountains, deep crevices and impenetrable jungle, lush vegetation with gum trees, mahogany, ferns, cedars and in between parrots and other creatures: Dominica, independent state in the Commonwealth, is still wild, pristine and one of regions with the highest precipitation on earth. A tribe of Caribs still lives in a reserve; apart from fruit plantations there is hardly any source of income for the inhabitants. The individual tourism has been distinctly pushed in recent years, the islands are very popular among scuba divers – some scenes of „Pirates of the Caribbean“ have been shot here. The safest anchorage of the island is Prince Rupert Bay with the village of Portsmouth in the north-eastern part of Dominica. This is also Port of Entry, when coming from North and offers facilities for shopping in Caribbean small shops and wooden huts. Hawkers offer round-island trips and boat trips on the Indian River. There is a fantastic vista from Fort Shirley on Prince Rupert Point. Possible anchorages are in the Anse de Mai or near the rather pretty main town of Roseau. There aren’t any marinas for Yacht Charter crews on Dominica yet but near the anchorages, several mooring buoys can be found and occasionally water taxis are provided. The French part of St. Martin is part of the French Department of Guadeloupe, the other part belongs to the Nethederlands Antilles. 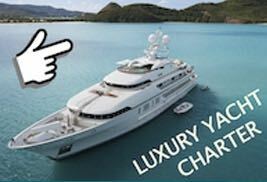 There are several Yacht Charter bases in Anse Marcel and Marigot on the French side and Oyster Pond.